My Home. My Life. My Choice. 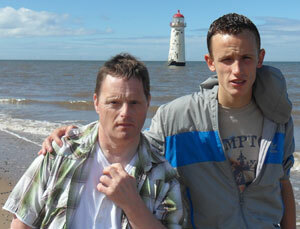 David and Joshua enjoy a local walk to Talacre Beach. Supported Living enables individuals to live a fulfilled life in their own home, as an integral part of their local community. Sometimes, a person will choose to share his/her home with others; sometimes they choose to live alone. Our clients may require guidance and assistance with everyday tasks such as cooking, shopping, budgeting and cleaning. Others may have personal care needs. Cartref Ni staff have a wealth of experience in delivering person centred support, providing a unique service to each client. This is reviewed and adapted according to their changing needs, wishes and aspirations. Accommodation is usually provided via a Housing Association, who act as Landlord, and maintain the property to the required standard. Each person that we support has a Tenancy Agreement and our support workers help them to understand their rights and obligations as Tenants. Occasionally, accommodation is owned by a private individual or group. Once again the client would have a Tenancy Agreement and Cartref Ni staff would help them to understand their rights and obligations as a Tenant.If you’d like to talk to us about how Cartref Ni can help you or someone you know, visit our Get in Touch page. We’ll be in touch with you within 5 working days. Copyright Cartref Ni 2019 ©. All Rights Reserved.